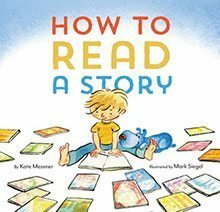 A step-by-step, slight­ly tongue-in-cheek but most­ly sin­cere, guide to read­ing a book, How to Read a Sto­ry by Kate Mess­ner, illus­trat­ed by Mark Siegel (Chron­i­cle Books), will have you and your young read­ers feel­ing all warm and cozy and smart. With advice in Step 2 to Find a Read­ing Bud­dy, we are cau­tioned “And make sure you both like the book.” That makes per­fect sense. Read­ing bud­dies, as drawn in a col­or­ful palette by illus­tra­tor and car­toon­ist Mark Siegel, can be old­er, younger, “or maybe not a per­son at all.” Per­haps a blue dog will wish to read with you. In Step 6, the sug­ges­tion is to read the dia­logue by say­ing it “in a voice to match who’s talk­ing.” The ink-and-water­col­or illus­tra­tions take up the nar­ra­tive, giv­ing us irre­sistible words with which to prac­tice, a lion, a mouse who says “I am the most POWERFUL in all the land!” and a robot who mere­ly says “Beep.” It’s excel­lent prac­tice for inter­pret­ing pic­tures and putting mean­ing into the words. We’re invit­ed to try our minds at pre­dic­tion in Step 8, as our read­er and his read­ing bud­dy, the blue dog, con­tem­plate what will hap­pen next. It’s a book that will make you smile, a good match between well-cho­sen words and play­ful illus­tra­tions, yet it’s a use­ful book for home and school and sto­ry hour. How can chil­dren learn the way to read out loud? How to Read a Sto­ry will have them try­ing before you know it. That sounds like such a great book! I’m wait­ing for great grand­chil­dren so I can buy books like this again. And I loved see­ing your smil­ing face, Vic­ki. Thanks for Bookol­o­gy — it’s like a vis­it. Why, thank you, Nor­ma. It’s thrilling to see the new, good books that are com­ing out by such skilled artists. But I also remem­ber the men­tors and teachers–people like you–who keep that tal­ent grow­ing.